A New York City career woman didn't know how to achieve what she envisioned for the look of her new summer home in Spring Lake Heights. But she had no doubt about what she wanted the home to be: a gift to herself for the years of hard work and, just as important, a gift to be shared with family and friends. White Shaker-style cabinetry has vintage brushed nickel hardware that complements the stainless steel appliances in the main kitchen. The perimeter and island countertops are black granite while the backsplash is white subway tile. The pendant lighting fixtures add a nautical accent. Gulian chose blue for the wall under the chair rail and beige-yellow above it. 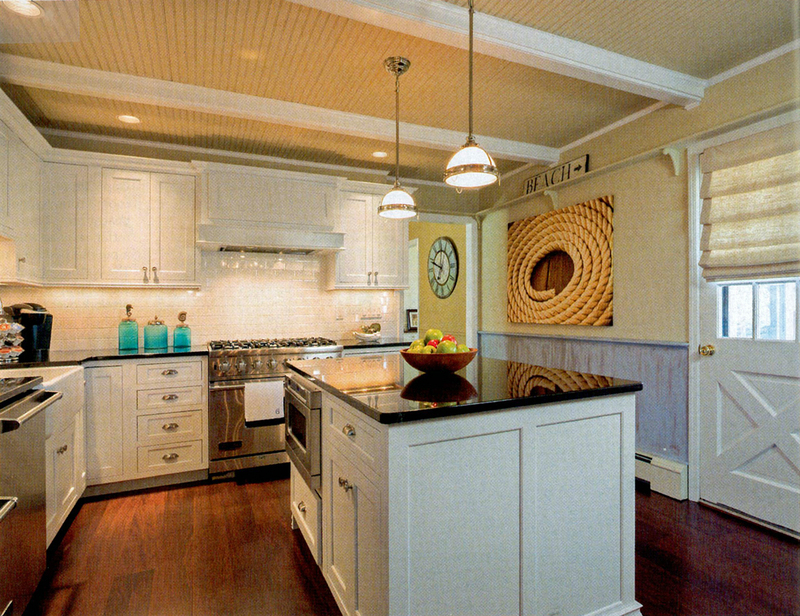 The bead-board ceiling is a deeper shade of the beige-yellow walls, and the decorative ceiling beams are bright white. View the full magazine article.